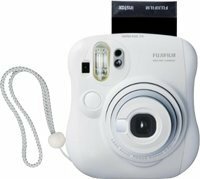 INSTAX Mini 25 - Stylish design. Light weight compact and easy to use - goes with you anytime, anywhere. The attachable close-up lens allows you to shoot from a distance up to 35cm away, creating enlarged images. With a high-quality Fujinon lens in combination with the INSTAX Mini Film, superior images are just an instant away. Electronic Shutter 1/3 - 1/400 sec., Image Size: 2.13" x 3.4"